The safest place for your baby to sleep is in the same room as their caregiver, but not in the same bed. Parents can always position baby’s crib next to their bed to easily maintain physical contact and encourage bonding. Your baby should sleep alone in an empty crib – keep loose bedding, bumpers, and toys out of the crib as this can increase your baby’s risk of suffocation and entrapment. 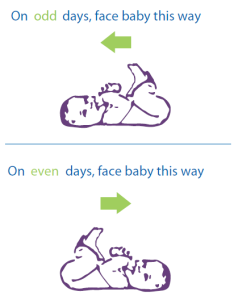 Babies should by placed facing alternate directions in their crib to discourage resting on the same side of their head. For example one night place your baby so their head is on the right side of the crib and the next night place baby so their head is on the left side of the crib. Avoid using sleep positioning devices because there is no evidence that these are effective and in some cases, they pose a danger to babies if they roll out the device. 1 Moon Rachel Y. SIDS and Other Sleep-Related Infant Deaths: Expansion of Recommendations for a Safe Infant Sleeping Environment. Task Force on Sudden Infant Death Syndrome. 2011; 128; 1341-1358. Tummy Time is essential to support your baby’s development. Have you started Tummy Time yet? Add these activities to baby’s daily routine to help them reach their milestones. Previous Previous post: Have You Started Tummy Time Yet?